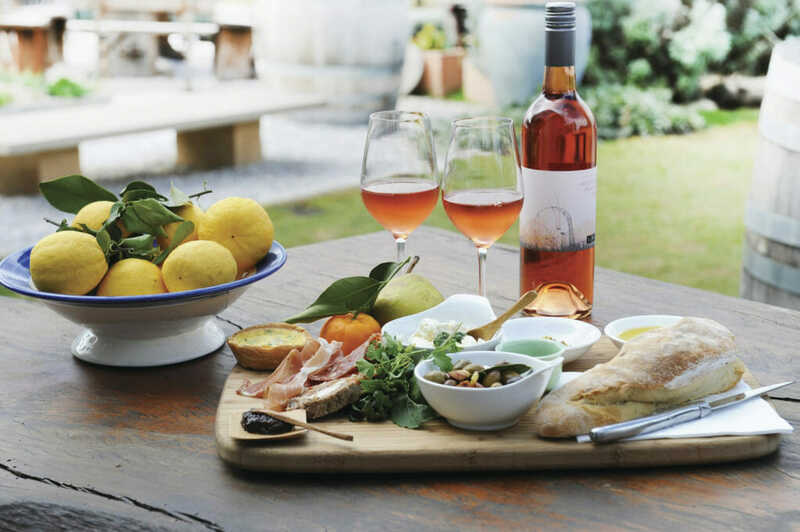 Winery hopping on a sunny afternoon, snacking on cheese platters and washing it all down with a glass of rosé – there are far worse ways to spend an afternoon. Wine-tasting used to be reserved for weekends away from the kids but wineries around Australia are slowly catching on to one undeniable fact: mums love wine. Dads too. 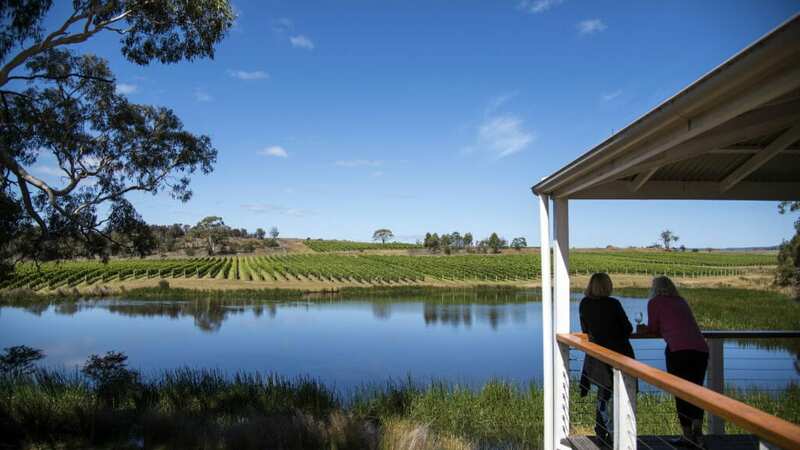 So we’ve done a state-by-state round-up of our favourite wine regions and found the best family-friendly wineries around Australia. 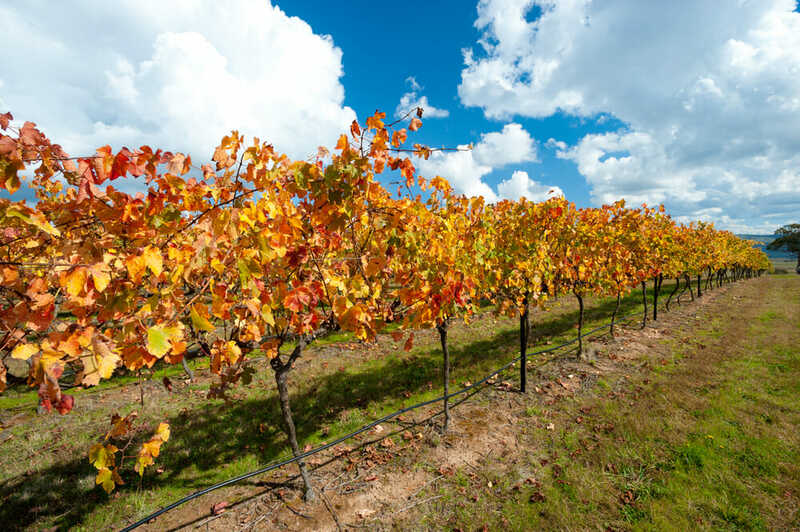 The Hunter Valley is the oldest wine growing region in New South Wales and boasts more than 150 wineries. The region’s pride and joy is the ‘Hunter Valley Semillon’, perfected over 150 years. Tempranillo is not too far from the spotlight either. For families, Scarborough Wine Co. in Pokolbin is a good place to start. The kids have hula hoops, a giant Jenga set, chalkboards and their own activity packs to keep them (and their taste buds) happy while parents swirl their Shiraz. 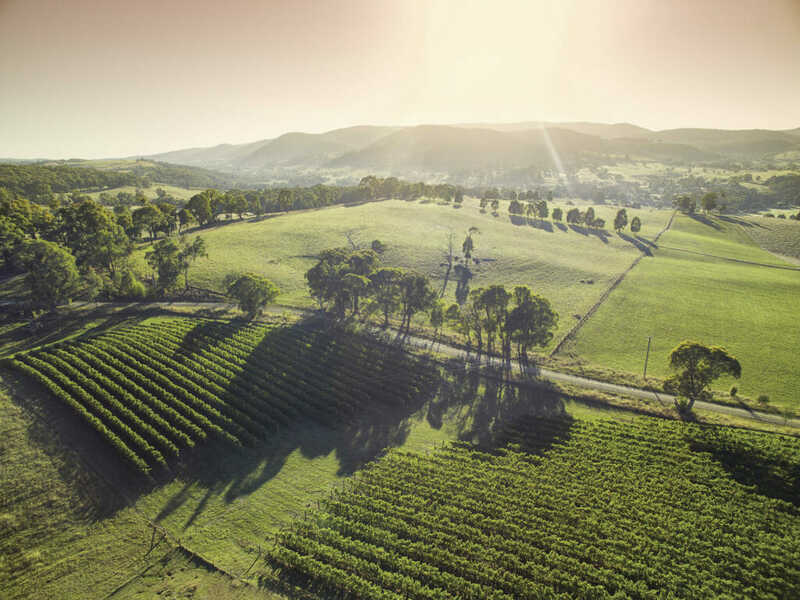 Just down the road, Wandin Wines in the Lovedale region offers award-winning wine, paddock-to-plate food and breathtaking views of the Molly Morgan Mountains. Wanda also participates in the regions famous Lovedale Long Lunch. Hint: Save this one for a weekend without the kids. The Hunter Valley has more than just wineries. Pack a picnic and head to Hunter Valley Gardens. It has over 25 acres of immaculate gardens, play equipment, boutique stores and even an aqua gold course. 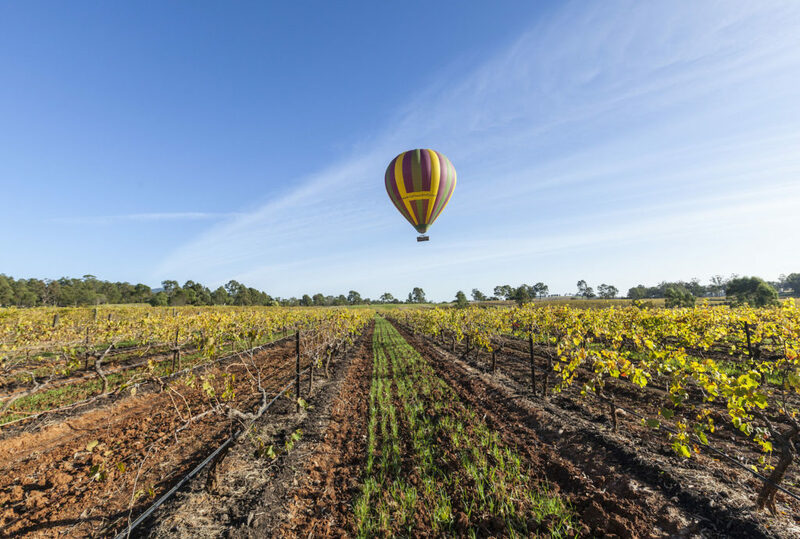 You can also take a hot air balloon ride over the vineyards or visit the Hunter Valley Zoo. This picturesque country town has quietly been growing a reputation on the foodie scene. The rich soil of the Central Ranges provides ideal conditions for wine growing (and for sitting back and sipping a Chardonnay or two). Mudgee’s hot days and cool nights are perfect for producing a wicked Cabernet Sauvignon and word has it, Moothi Estate does it best. Kids will love running around the huge grassy field while the adults sample a drop of red or a locally brewed beer. Prepare to spend a few hours at your next stop. 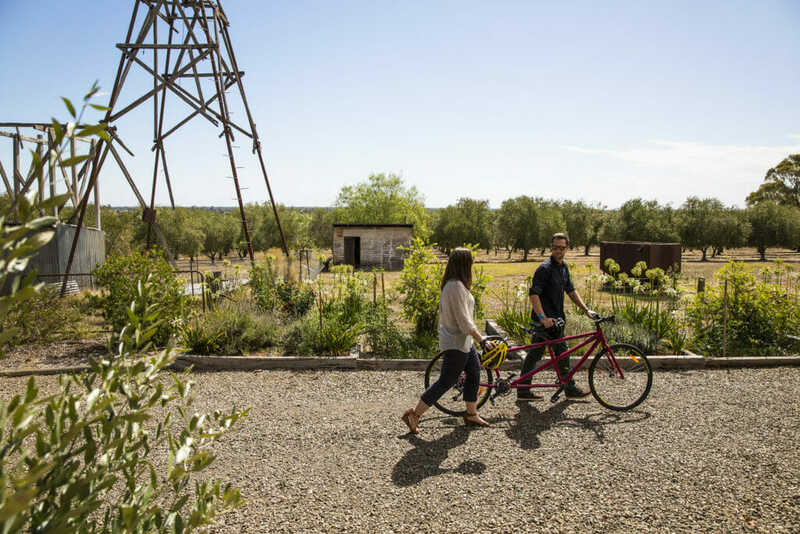 Lowe Wines has a wine walk and cycle trail that takes visitors on a tour of the property. You’ll discover rescue donkeys, wooded picnic areas, a chook palace and, of course, grapes upon grapes upon grapes. 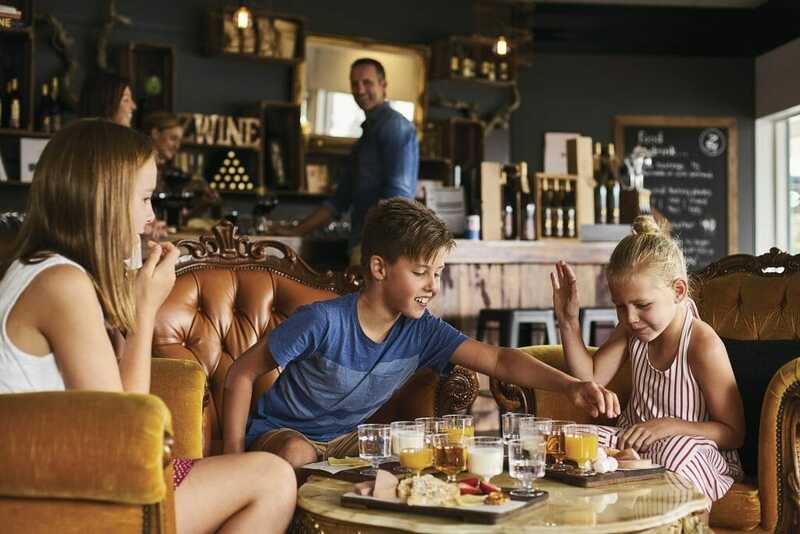 For more family-friendly wineries in Mudgee, read our guide here. Riverina is the largest wine producing region in New South Wales, but it isn’t the big name brand that has made it famous. The regional speciality, Botrytis Semillon, is the result of 90 years of thoughtful, small-scale production by the De Bortoli family. See where it all started at the Bilbul cellar door. After the kids tire themselves out in the playground, refuel over lunch at the restaurant. The children’s menu has everything from beef lasagne to doughnuts with caramel sauce. The Yarra region is only an hour from Melbourne but it feels a world away. 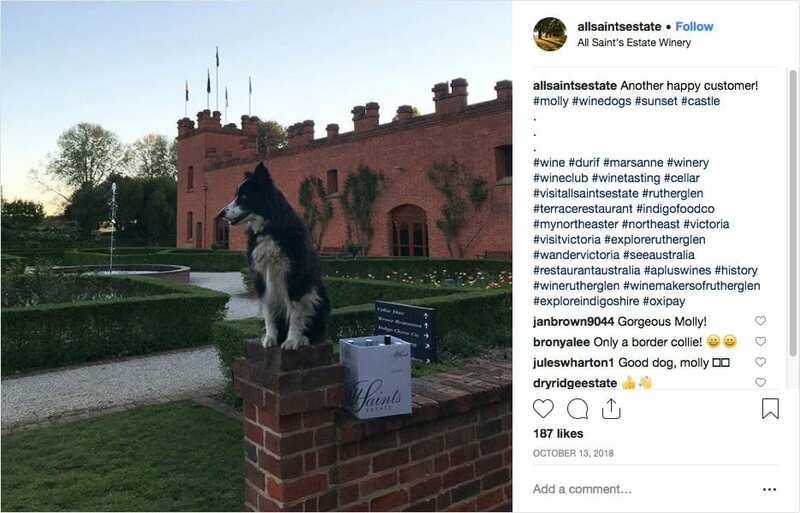 It’s the oldest wine growing region in Victoria and was also the top choice for Champagne giant, Moët & Chandon when they established their Australian outfit in 1986. The Yarra Valley has plenty of family-friendly wineries to visit. Payne Rise has a relaxed Cellar Door, set on a huge property with kids games and outdoor activities scattered around the vineyard. If you’re visiting the Yarra during school holidays, kids will love getting involved in the art and activity program at Tarrawarra Estate. 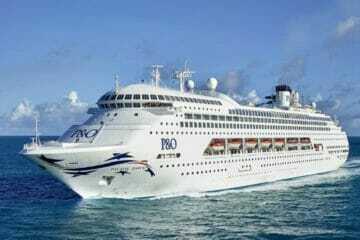 The adjoining museum and restaurant provide hours of entertainment for the whole family. Read our full guide to wine tasting in the Yarra Valley here. 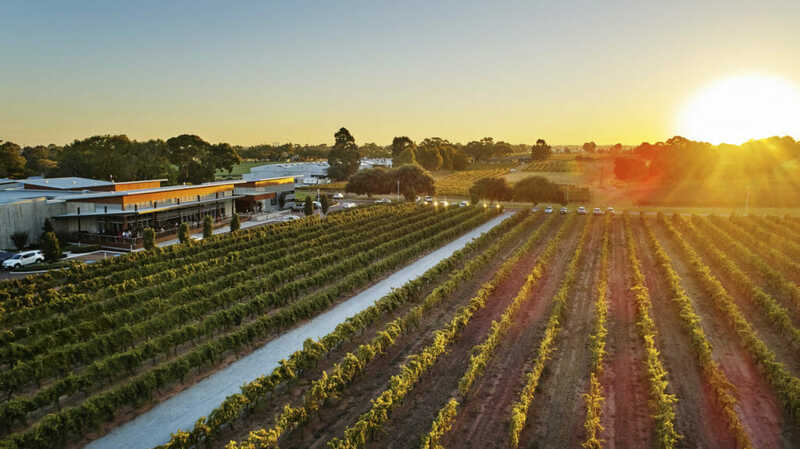 Rutherglen is a lesser-known but equally bountiful wine-producing region in Victoria. Fewer bus tours, less crowded tasting rooms and plenty of family-owned and operated wineries to tickle your taste buds. The Rutherglen region is known for its sweet wines so make sure you try a drop of tawny while you’re there. The WickedVirgin & Calico Town Wines should be at the top of your itinerary. This small, family-owned vineyard produces boutique wins and a range of award-winning olive oils and preserves. Keep an eye out for the resident peacocks strutting around the grounds and pay a visit to the friendly chooks. For Disney-lovers, All Saints Estate is a must visit. The main building is a flag-bearing castle set amongst perfectly-manicured gardens. Parents can try the stellar shiraz while kids burn some steam playing frisbee on the lawn. Before you go, don’t forget to pop next door for a cheese tasting at the Indigo Cheese Co. The Peninsula is worth a visit for its breathtaking scenery alone. The wine is just a bonus! The region’s cool climate provides the perfect environment for the production of Pinot Grigio and Chardonnay, but it’s the Pinot Noir that wine-lovers are buzzing about. Willow Creek Vineyard is a great place for families to start their wine trail. This 11-acre vineyard is home to the Rare Hare, a restaurant and Cellar Door offering mouthwatering wood-fired wood and elegant, single-vineyard wines. Tasting is available everyday – we recommend trying the ‘O’Leary Block’ Pinot Noir. Dormant Estate is both child and pet-friendly. The casual atmosphere means kids can run about while parents enjoy a glass of wine in the sun. The cafe has plenty of options for kids and prices at the Cellar Door are reasonable so it’s worth taking a bottle or two home for later. 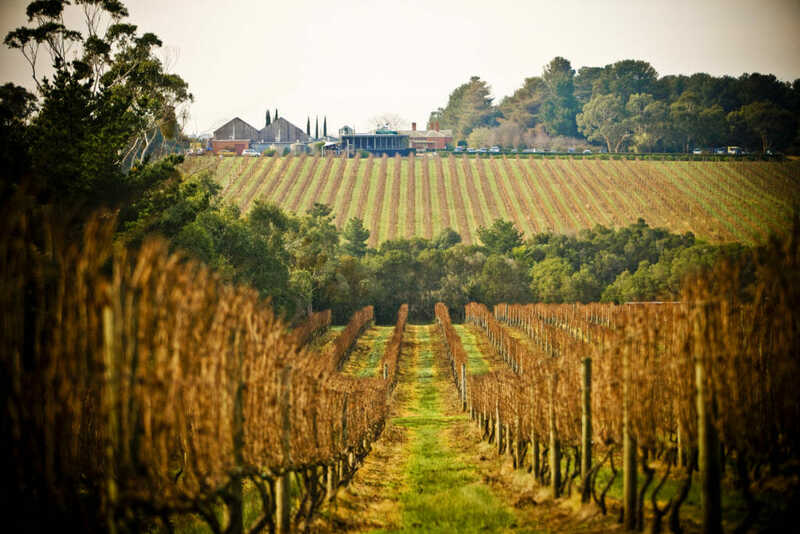 The Barossa Valley is perhaps Australia most well-known wine growing region. Its reputation is partly owed to national treasure and face of the Great Australian Bake Off, Maggie Beer. Grabbing some goodies from her shop at Pheasant Farm is a must on any Barossa Valley itinerary. To wash down your charcuterie, sample Maggie’s Heritage pear cider or the Pheasant Farm Rosé. Your next stop should be Liebichwein. At this family-owned winery, kids get to join in on the tasting. Res soft drink served in plastic wine glasses will have the kids feeling ever-so-sophisticated. Another great spot in Z Wines. For just $8, kids can enjoy their own tasting platter with a selection of juices, paired with fairy bread, fruit and pretzels. Parents, we haven’t forgotten about you. Try the delicious cheese and wine tasting board for adults. For more family activities in the Barossa Valley, read this story. McLaren Vale has a surprising number of offerings of families. A number of vineyards have playgrounds, petting zoos, trampolines and mazes. For animal lovers, Gemtree is a great spot. Kids can meet the two resident alpacas, Gus and Caruso and hang out in the playground with their kids’ activity pack. 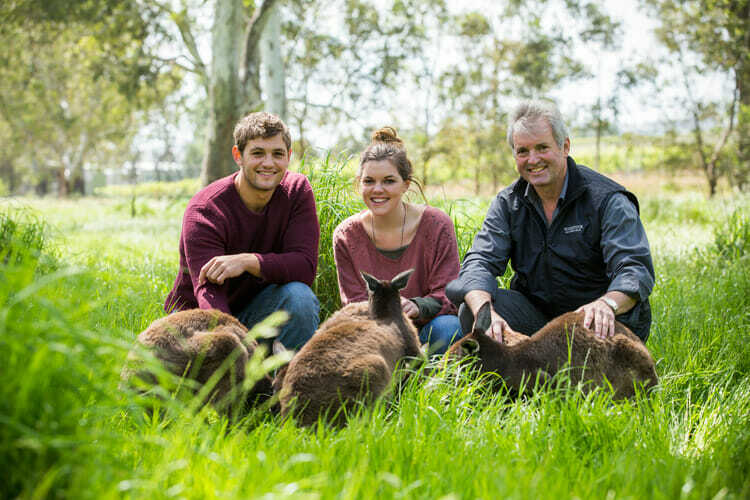 At Woodstock Wines & Wildlife Sanctuary, families can meet Long-nosed Potoroos, Brush-tailed Bettings, wallabies and kangaroos. You can even join one of the kangaroo feeding sessions that occur daily from 11:30am-12pm. After meeting your furry new friends, pop back up to the Cellar Door and enjoy a tasting session in the sunny courtyard. 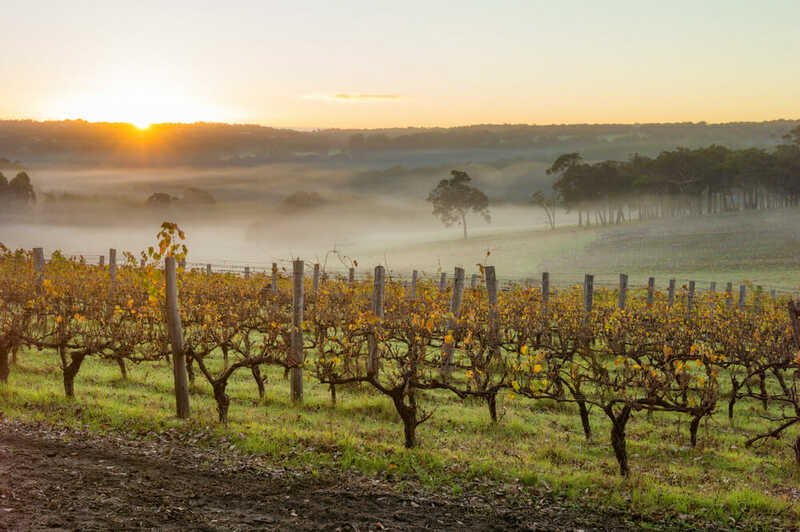 Right on the backdoor of the South Australian capital, the Adelaide Hills are known for lush vineyards, bountiful fruit orchards and delicious dairy goods. Foodies will love stocking up on creamy cheeses from Udder Delights, sweet treats at Melba’s Chocolate and Confectionary store and fresh cherries you can pick yourself at Beerenberg Farm. Quench your thirst with a drop from one of the regions 60 wineries. Barrister’s Block is a family favourite. Kids could spa hours playing in the huge sandpit, equipped with trucks, spades and toys. There’s also a farmyard full of alpacas, deer, chickens and geese. Golding Wines is another top pick for families. Families can enjoy live music on the lawn, special events for Mother’s & Father’s Day and a real treat on Paella Day. Looking for more activities in the Adelaide Hills? Read our guide to the Adelaide Hills with kids. Western Australia’s food & wine capital has more than 5,000 hectares of vineyards, so you certainly won’t go thirsty during your visit. The region has enjoyed huge growth in recent years with micro-breweries and trendy boutique wineries popping up all over the region. One of our favourite family-friendly wineries is Credaro Family Estate in Yallingup, 30 minutes from Margaret River’s town centre. For nearly 100 years, the Credaro family have been managing 120-hectares of vines around WA. Welcoming families to their Tuscan-style Cellar Door, wine tasting sessions are best followed by a picnic lunch on the lawn with sweeping views of the Wildwood Valley. This next one is technically not a winery but it is absolutely worth a visit. Cheeky Monkey Brewery in Wilyabrup has a huge fenced-in playground for kids, a Cellar Door for wine lovers, a sprawling field for four-legged friends and a micro-brewery, showcasing some of the finest brews on the West Coast. For more watering holes to check out in Margaret River, read our guide here. Born from Yugoslav, Italian and English migrants, the Swan District is the oldest wine growing region in Western Australia. Verdelho is the regional speciality but the vintners also make a mean Chenin blanc. The hot Mediterranean climate does wonders for the grapes, but it also sets the scene for a fabulous afternoon of wine tasting. Start your wine trail at Mandoon Estate. It’s WA’s most awarded boutique winery, and after one drop, you’ll see why. You can also build your own picnic. Choose from a range of charcuterie, cheese, and pizza and lounge around on a picnic table with a bottle of your favourite wine. Edgecombe Brothers Estate is another great spot with a relaxed vibe. Visit on a Friday afternoon and grab a gourmet burger from the Burger Kitchen pop-up. Parents can sample the premium and fortified wines, plus a few cheeky liqueurs to satisfy those with a sweet tooth. The Tamar Valley’s wineries hug the shores of the region’s thunderous tidal river. From Launceston to the coast, the fertile vineyards produce some of the best sparkling wine in the country. Holm Oak Vineyards in Rowella is a nice place to stop for a spot of wine tasting. 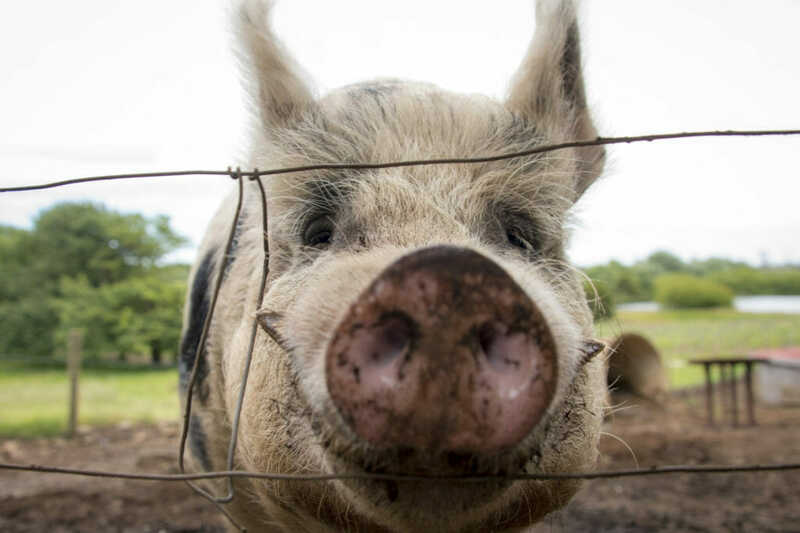 Kids can grab a bag of apples to feed to Pinot the pig while they wait. If you’re visiting the region in summer, stop in at Hillwood Strawberry Farm to pick your own fruity treats, or opt for strawberries of the frozen variety at the ice-cream stand. The East Coast is a fabulous self-drive destination, particularly for wine lovers. You’ll have to take turns being the designated driver, but the fabulous scenery is worth making use of the spittoon. The Great Eastern Drive leads road trippers to some of the state’s most renowned and family-friendly wineries. Freycinet Vineyard is a 15-hectare family-owned enterprise, producing 5-star wines, cheese, extra virgin olive oil and great coffee. Further along the wine trail, lovers of Pinot Noir will be treated to a quality drop at Milton Vineyard. Save some room in your camera roll for this one. The cafe deck overlooks a sparkling dam with vineyards extending over the horizon, providing some near-perfect family-selfie conditions. From Mt Tamborine to Albert River, the Gold Coast Hinterland is dotted with boutique wineries and historic homesteads. The varied climate, from the mountains to lower-lying valleys, allow a variety of grapes to flourish. Wine lovers can sample everything from Merlot and Cab Sav to Chardonnay and Rosé. If you only visit one Cellar Door in Gold Coast Wine Country, make it O’Reilly’s Canungra Valley Vineyards. Part of O’Reilly’s Rainforest Retreat, this family-run winery offer more than excellent wine tasting. 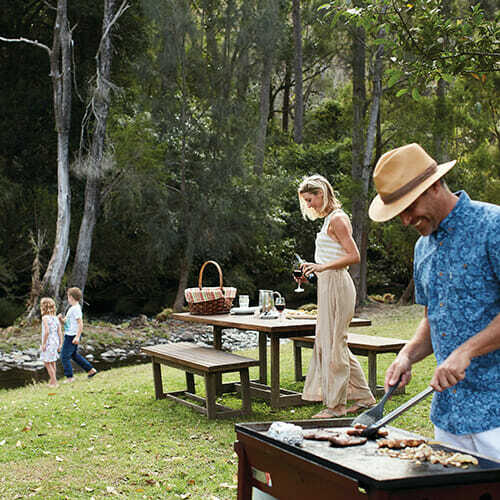 Find a stop on the extensive grounds and dig into a gourmet picnic basket, breakfast hamper or BBQ pack. You can even share your picnic with an alpaca. O’Reilly’s also has awesome wildlife encounters, a Flying Fox Adventure, bird shows, 4WD tours and glow worm experiences. An ancient volcano forms the backdrop of this unique wine growing region. 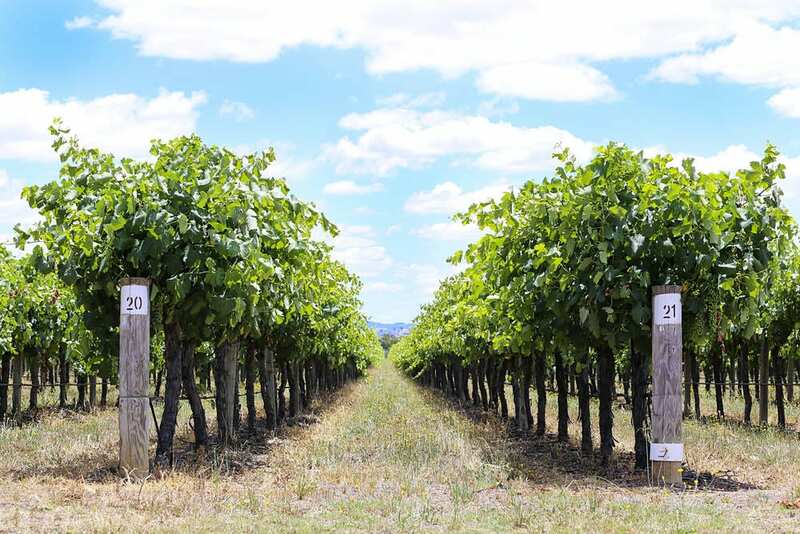 The Scenic Rim’s first vines were planted in the 1870s when wine was sent back to the UK. Today, the region is a popular spot for day trippers, just an hour from Brisbane. The Overflow Estate is worth a visit for the location alone. 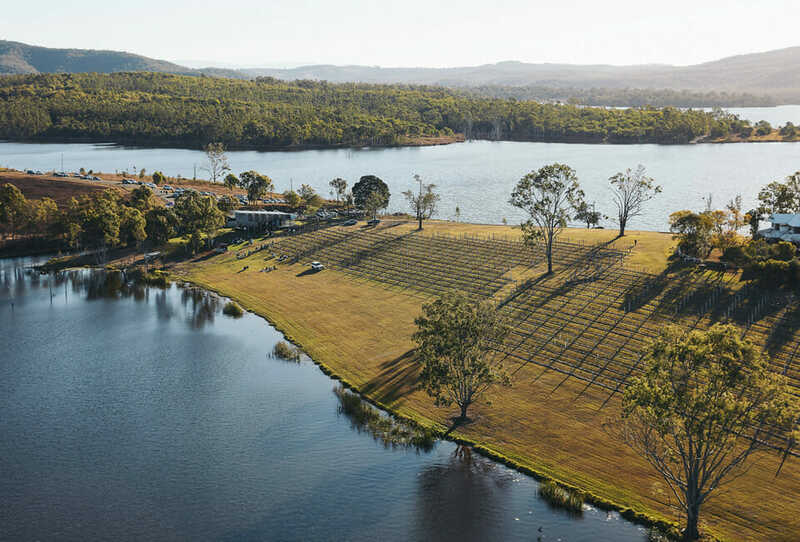 This boutique vineyard sits on an island in the middle of Wyaralong Lake. The gourmet cafe proudly caters to dietary restrictions and has a fantastic grazing menu including picnic baskets, seafood platters and tapas spreads. Another note-worthy spot is Ironbark Ridge, southwest of Ipswich. The extraordinary mountain views are made even better with a splash of shiraz and a generous cheese board. 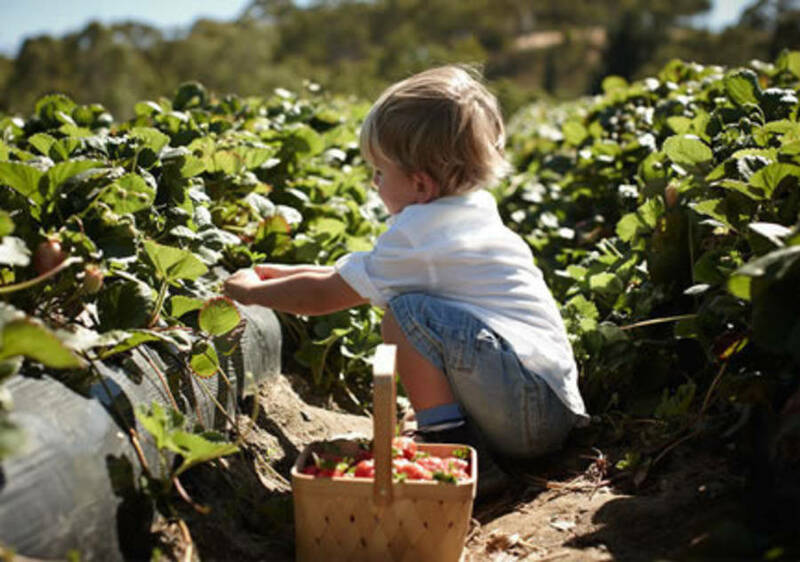 The Canberra District may not be the largest wine growing region in the country, but it has no shortage of vineyards for families to explore. 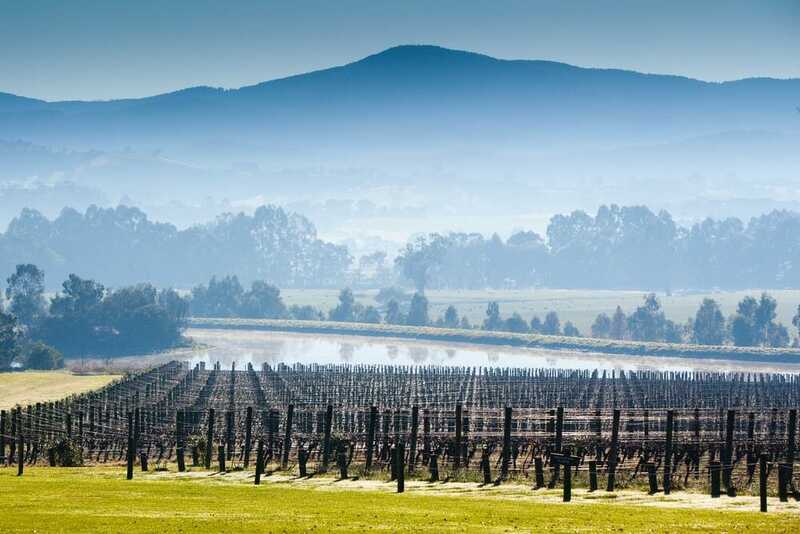 Some 110 vineyards are spread between Lake George and Yass, each offering a variety of cool-climate wines. The regional hero? Shiraz. Murrumbateman Winery is a great place to spend the afternoon. Kids can make use of the ping pong tables, chalkboards and colouring books while parents sample the goods. Don’t forget to order a tasting plate with your wine. A handy hint – the Pinot Gris goes wonderfully with the char-grilled capsicum. Families looking to satisfy their sweet tooth should head to Robyn Rowe’s Chocolates. After you’ve stocked up on these handcrafted Belgian-style treats, burn off some energy out on the lawn with a game of quoits, totem tennis or juggling. The Northern territory certainly isn’t known for winemaking, but visitors will be pleasantly surprised to find a family-friendly winery 180km north of Alice Springs. 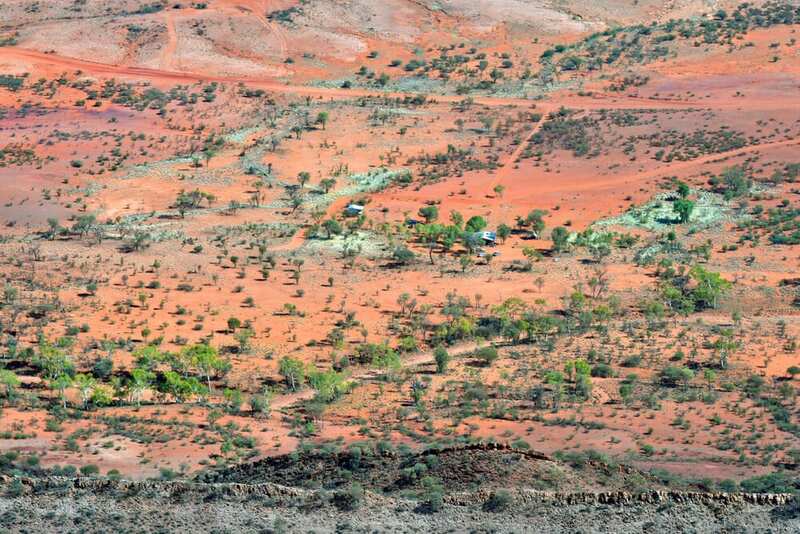 Red Centre Wines takes up 9-hectares in the heart of Central Australia, producing a range of small-batch wines such as Shiraz, ruby cabernet and Riesling. However, the mango wines tend to steal the show.